So, I passed United States. The United States was driving fifteen miles an hour in the breakdown lane with the flashers on. The Baby on Board suction cup had gone south and the laminated placard flopped on the rear deck like a fish on the beach. The back seat was full of unread newspapers and bees and sticky empties with no deposits. Three tires were bald and the fourth was a solid rubber tricycle wheel and half as effective. All the windows of the United States that weren't shot out were rolled down and you could hear the AM radio tuned to NEWSTALK RADIO! doodoodoodoo-doo offering to paint somebody else's favorite car for $49.99 including rims and doorjambs if you had any. There was enough smoke for a new pope coming out of the gossamer remains of the tailpipe. The United States saw no point in pulling over because the gas gauge read E-and-a-half and the spare was on the car already and the tire iron was in a police evidence room somewhere. The United States spun armadillos like failed seven-ten splits as they lie quiet in the gutter with their leprous limbs pointed heavenward and praying to the last dread god who had made them pay for another armadillo's sins which were not confessed. The United States rolled on. The United States was not a color. As the sun set like an infected eye it became the color of whatever pool of neon shone on the spidered pavement from the signs of deserted motels. The United States was the color of a rainbow that only dogs could hear. There was a man. There was a man at the wheel. He would not stop. 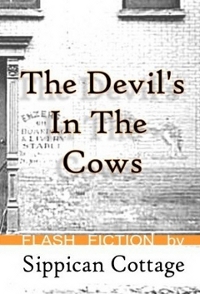 He slowed only to crack the driver door and set the golden gallon jugs on the pavement. This dream's in sight. You've got to admit it. Pretty damn good. Especially on the third time through. ...this is on frequent rotation on that independent station - WJAZ: "Jazz and conversation from the foot of Mt. Belzoni"
Anon- I actually knew two people who came from "the foot of Mount Belzoni": Pinetop Perkins and Albert King. It's an obscure reference to Indianola, Mississippi that no one ever gets, I think. There's no mountain, either. It was too mellow for me; I need a touch of harshness, or I go to sleep. "The United States was the color of a rainbow that only dogs could hear." Is this your own work? Or was this somehow involved?